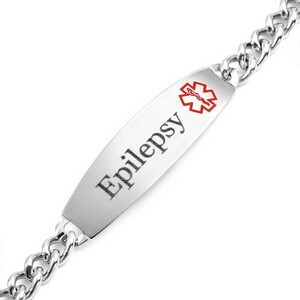 This wide-style Epilepsy bracelet is made of 316L surgical grade stainless steel. Comes with red medical symbol. Choose between traditional (etched) style engraving or black/lasered engraving for this item when you select your font. Both are hypoallergenic, but 316L is non-corrosive and it is also known as marine grade stainless steel due to its increased resistance to chloride corrosion compared to type 304. Bracelet closes with lobster clasp.